A summary of the principal observations accumulated by the senior author and colleagues since 1970, concerning the histopathology of DED, is presented. An overview of events occurring in disease development are exposed such as: invasion of secondary vessel elements and accumulation therein of extraneous material (including the alveolar network), attack of vessel walls (in association with masses of electron opaque material) and surrounding tissues up to the cambial area, pathogen action on proto- and metaxylem tissues, and similar observations of differentiating tissues, where cell malformation is often pronounced. Various types of cytoplasmic reactions in the axial parenchyma of secondary xylem, are mentioned. Some of these, considered detrimental, range from a high vacuolization of the cytoplasm, of pronounced organelle alterations up to complete cytoplasmic disintegration; other reactions may be considered of a defense type: increased opacity and density of the cytoplasm, accumulation of large amounts of opaque or more translucent matter in large vacuoles, and so on. These are ordinarily accompanied by wall modifications, such as an increased density and opacity of the protective layer. Intermediate situations exist. 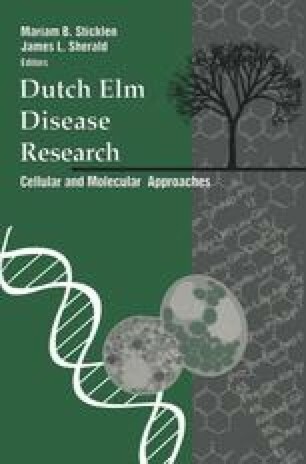 Wall modifications in parenchyma cells and fibers in normal wood or in barrier zones are thought to be associated with trees showing some degree of resistance or having partially recovered from acute symptoms. As a corollary, susceptibility can be associated with a lack of such reactions, particularly in shoot and twigs where tissue disturbances seem to be most prominent. It is stressed that all the disturbances observed are associated with the presence of masses or strands of opaque matter. These observations point to the necessity of characterizing further these opaque constituents, or at least recognizing that a problem exists that calls for the formulation of new concepts.